To apply and conduct of NAAC Cycle-3 Accreditation. To introduce new courses at UG & PG level in emerging areas of technology. Modernization of more class rooms to e-classrooms using ICT tools. To make researgence portal functional. Conduct of workshops on the theme "Blended Learning" to all faculties of the Constituent Colleges. To embrace technology and digital initiatives, further to the development of skills and research and enable our students to have access to lifelong learning, we shall aim to become a leader in technology enabled teaching – learning and research institution. To develop focused Centres of Excellence on areas with potentially large societal impact in alignment with India's development goals. To design and develop a multidimensional Research Innovation Ecosystem to nurture academia – industry collaboration. Establishment of Research & Development Centre for Regenerative Medicine and stem cell based artificial organ transplants. 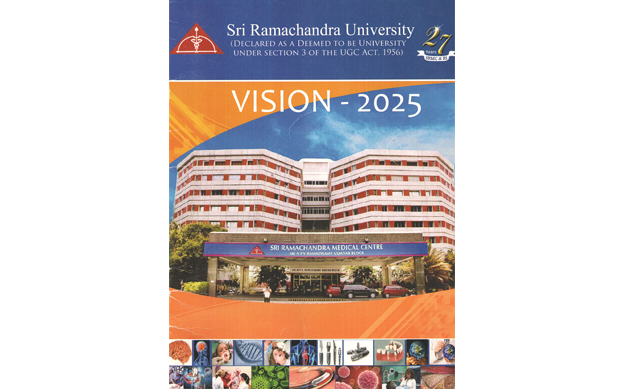 To establish 'SRI RAMACHANDRA INNOVATION INCUBATION CENTRE (SRIIC) as an ideal Research and Development Innovation Ecosystem of the university which enable to nurture start up culture among young entrepreneurs.